Here you can see the newest updates on the site, and see whos online, up Above you see the menu bar hit "Home" to go to the Forum. Enjoy your Stay! » Do You Like The Site? Toontown Lot News Update ____________________________________________________________________________ Toontown Lot Bean Fest! Celebrate accessories all weekend by hosting and attending Toon Parties wearing your best and zaniest accessory outfits! 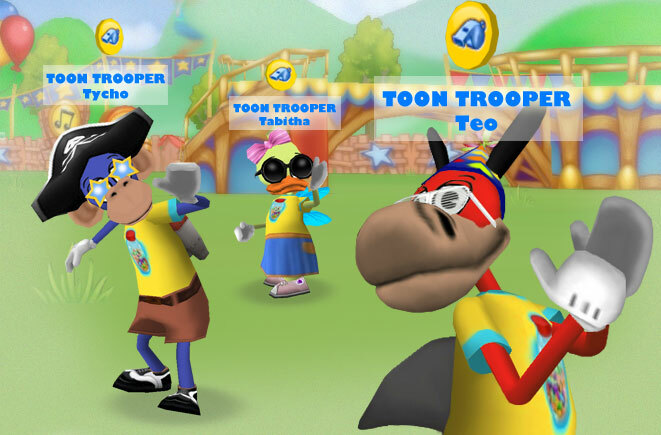 Toon Troopers TEO, TABITHA, TYCHO, TATUM and TOBY will be making surprise appearances this Friday, Saturday and Sunday, August 19 - 21 in Toon Parties! Teo, Tabitha, Tycho, Tatum and Toby will be on the lookout for Toons wearing the wackiest and most stylish accessory combos. YOU can be on the lookout for them popping into Toon Parties this weekend in the following Districts: - Boingy Acres - Boingy Bay - Boingy Summit - Boingyboro - Bouncy Summit - Crazy Grove - Crazy Hills - Crazyham They’ll be checking out your Toon accessory Parties in the afternoons between 2pm - 4pm this weekend (PST). Make sure you say “hi” and really wow the Troopers with your accessory know-how! It's always easy to spot a Toon Trooper with that whistle symbol over their heads!